NEW YORK—Children attending day care and school-based programs in the city will be required to have an annual flu shot, starting late next year. 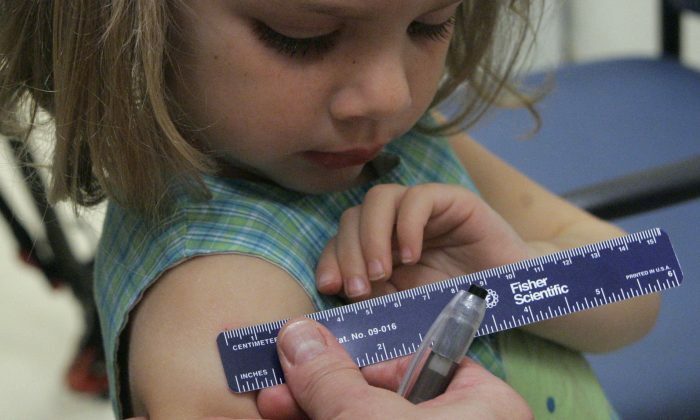 New York’s Board of Health voted Wednesday to mandate that children between the ages of 6 and 59 months (almost 5 years old), have the vaccine before Dec. 31, 2014. Children who have not been vaccinated by that time will be barred from schools and day care programs. The rule affects roughly 150,000 children in New York City. Parents who don’t want their children vaccinated can apply for either a medical or religious exemption through their school or day care center. Between 10 and 40 percent of children under the age of 5 catch the flu every year, and 1 to 2 percent are hospitalized because of the disease, according to the city Department of Health and Mental Hygiene (DOHMH). Last year, four children under the age of 5 died from the flu in New York City. “Day care children are a major source of influenza spread,” Jay Varma, DOHMH deputy commissioner for disease control, told the Board of Health at a meeting in Queens Wednesday. Varma said numerous studies showed that “herd vaccinating” children lowered flu rates for other age groups, particularly the elderly, who are especially vulnerable. Besides the flu shot, children entering day care and other school-based programs will be required to have four doses of pneumococcal vaccination. Adding this vaccination to the requirements under the city’s health code brings the city in line with state law, health commissioner Thomas Farley said at the meeting. The Board of Health received 276 written comments about making the influenza vaccine mandatory. Of those letters, 247 opposed the vaccination. Almost half of those who opposed the vaccinations used an identical form letter, and 25 percent came from outside the city. Additionally, 19 people testified at a public hearing on Oct. 23, 2013—all opposed to making the vaccines mandatory. The speakers cited worries about potential harmful side effects from toxins in the vaccine, including a concern that the vaccine could be linked to autism. The DOH states that the link between the vaccine and autism has been discredited in several studies. A department handout stated that the single-dose vaccine, which is most commonly administered to children, does not contain an ethyl-mercury compound linked to autism. Despite the submissions from the public, the Health Department did not alter the text of the amendments to the health code, which mandates the flu vaccines. According to the health department the only complications associated with the influenza vaccine were allergic reactions. The vaccine is inactive, unlike the nasal influenza vaccination, which carries minute amounts of the live virus. Pamela Briar, a member of the Board of Health, said the public needs more education about the vaccinations. “I think people are generally confused. People have a lot of wacky ideas,” Briar said. Flu strains mutate each year and matching strains to the appropriate versions of vaccines can prove a challenge for researchers. The Centers for Disease Control and Prevention estimate that the vaccination developed for this year’s flu season is 64 percent effective. The most vulnerable to influenza are those with weaker immune systems, such as the very young, the elderly, and the chronically ill. Flu season normally starts in January and runs through March, or sometimes as late as May. During the 2012–2013 flu season, 65.2 percent of New York City children aged 6–59 months received a flu shot. At the Hudson Guild day care center on West 26th Street, Lisandra Lopez said some of the parents at her center already have their children vaccinated against the flu. “For those that have never had [the vaccine], you might have parents that will go with the requirement because they want to keep their child in day care, and you might have some that will opt out from getting it,” Lopez said. If children get sick they are not allowed to attend day care until they “come back with a doctor’s note to make sure they kid is not contagious,” Lopez said. Victoria Tambone, 28, said the flu vaccine was a great idea, “It lessens the chance of infection.” Tambone said her 4-year-old daughter often picked up colds at day care and then infected the rest of their family. Her friend Amalia Rod, 23, is the mother of a 4-year-old boy. She hoped the vaccine would prevent the children from getting sick as frequently. “I think it’s good” because it “kind of forced” parents to get their child vaccinated. Another Chelsea mother Taeya Clark, 37, said her 3-year-old son Zion was diagnosed with scarlet fever last year, so after he was treated she made sure he had all his vaccinations. “With day care they have got all kinds of germs going on there,” she said. The amendment to the New York City Health Code, which made the vaccines mandatory, was passed unanimously. Before flu shots, NyQuil, and Mucinex, native tribes and early American settlers had their own arsenal of cold and flu treatments--herbs.